After three years, the Army Corps of Engineers is roughly halfway through a $7.8 million study of economic and environmentally feasible ways to expand the federal shipping channel in Mobile Bay. An open house was held last week in South Mobile County to provide updates on preliminary findings that will eventually be documented in a general re-evaluation report (GRR) federal officials will use to select the best expansion option for the 36-mile channel. 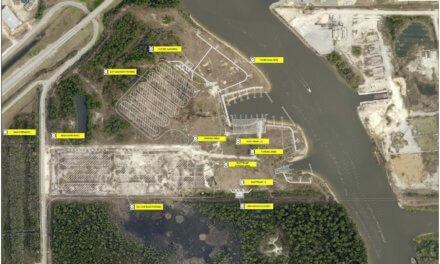 While any proposal will ultimately require congressional approval, project manager David Newell said the Corps is currently evaluating an expansion model that would deepen the length of the channel by five feet to a 50-foot depth while widening a five-mile stretch in the lower part of Mobile by 100 feet to create a passing lane for ships. 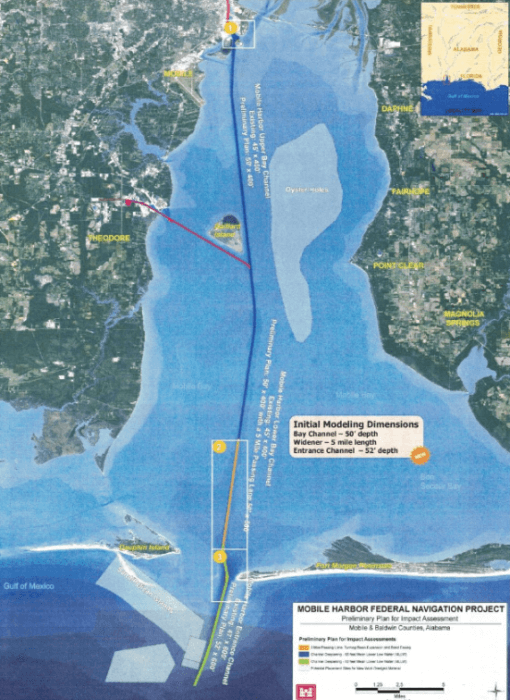 If approved, an expansion like the one Newell mentioned would be similar to what was initially proposed by the Alabama State Port Authority in 2014, which would have created a five-mile passing lane without increasing the current 45-foot depth of the channel. However, at ASPA’s request, the Corps was asked to evaluate the cost of further expansions and what impact they may have from an economic and environmental standpoint. While the cost of the project is unknown, it could easily be in the tens of millions of dollars. For perspective, the project considered in 2014, which would not have deepened the channel at all, came with an estimated cost of $15 million. The cost of all construction in federal ports is split between the federal government and a non-federal partner, which in this case is ASPA. Historically, that has meant the state only paid 25 percent of project costs, but if the port were to expand to a depth of 50 feet or more the ratio shifts to a 50-50 split. According to Adams, ASPA will also have to pay a portion of future maintenance costs equal to 10 percent of the total project cost. That means if the project were hypothetically priced at $50 million, it would ultimately cost ASPA $30 million. However, at whatever price, federal law dictates any expenditure must provide “a return on investment” for every dollar the government spends. While the financial benefits of an expanded port can be quantified in many ways, the Corps recently released a chart showing the “net benefits” generated by every foot of depth potentially added to the shipping channel. Based on that chart, an additional five feet of depth could have a net benefit of more than $50 million. However, those dollars wouldn’t be directly collected by the federal government, but would instead be passed on to consumers from “origin-to-destination transportation cost savings” that would result from larger cargo ships carrying more goods in a fewer number of trips. With last week’s open house in the coastal fishing community of Bayou La Batre, questions were raised about whether saltwater intrusion from increased dredging might impact aquatic life in the bay and the industries that harvest it. While Newell said there is some “concern” over saltwater intrusion, the extent of any potential impact is still unknown at this point in the study. Previously, the Corps has established a baseline of existing resources including “wetlands, sea grasses, oysters, fish and bay bottom communities” — data Newell says will be used going forward to estimate the impact an expansion could potentially have on those communities. “Results from the water-quality modeling being conducted to predict changes in salinity — along with other water-quality parameters — are being used to compare differences between the existing conditions in the bay and future conditions that would result from deepening and/or widening the channel,” he added. 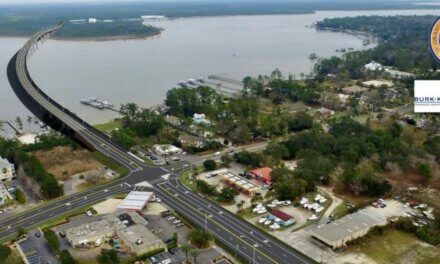 While there have been some criticisms about public access to the details of the GRR, a Corps spokesperson said events such as last week’s open house and a previous meeting held in Daphne are intended to give the public an opportunity to ask questions and provide input. As it has for years, the discussion of dredging activity in the federal channel also brought up concerns about erosion on Dauphin Island and whether any dredged material could be placed in a location more beneficial to the restoration of the barrier island. However, when it comes to the contention that routine maintenance dredging has contributed significantly to erosion seen on Dauphin Island, Newell said The Corps’ position hasn’t changed.